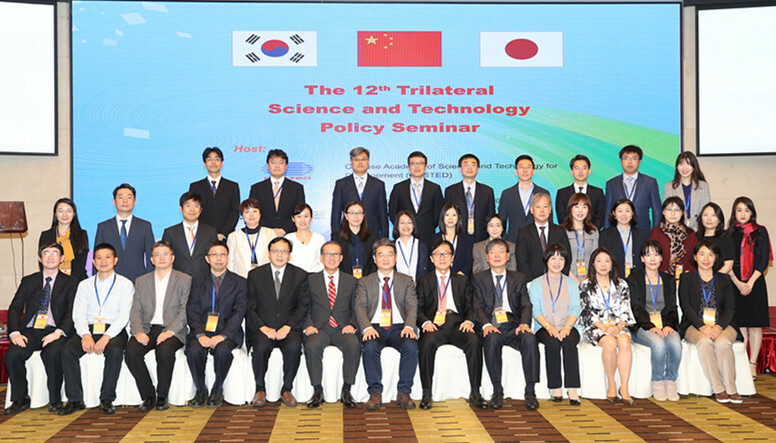 The 12th China-Japan-Korea Seminar on Science and Technology Policy was held in east China’s Hangzhou on October 19 and 20, 2017. It was attended by more than 50 scholars from five institutes of S&T policy in three countries: the Institutes of Science and Development under the Chinese Academy of Sciences (CASISD) and the China Academy of Science and Technology for Development (CASTED) from China; the National Institute of Science and Technology Policy (NISTEP) from Japan; and the Science and Technology Policy Institutes (STEPI) and the Korea Institute of Science and Technology of Evaluation and Planning (KISTEP) from South Korea. The participants discussed the latest developments in S&T strategies and policies in the three countries, and shared important research progress made by the five agencies in the past year. Focusing on the policy practice to cultivate new momentum for economic development through S&T innovation, the meeting conducted discussions on a variety of topics, ranging from developing an innovative society through international cooperation in S&T innovation, entrepreneurship and employment in the context of globalization or de-globalization, to the methods and conclusions of technical foresight. CASISD Vice President Zhang Feng briefed the participants on the recent research progress of CASISD concerning S&T and innovation policies, consulting services to national macro-decision-making and the construction of strategic cooperation networks and think-tank platforms. Prof. Mu Rongping, a leading member of CASISD, presided over discussion panels. CASISD researchers, including Profs. Yu Jiang and Tan Xianchun, Associate Profs. Qu Wan and Fan Yonggang made presentations at the meeting. The annual seminar was jointly launched in 2006 by the five S&T policy research institutions. A rotation mechanism is adopted for its convention with the objective to promote academic exchanges and cooperation in S&T policy, innovation strategy and performance management. The five agencies have agreed to co-host international conferences or academic seminars at major international conferences to showcase their advancement of S&T policy and strategy studies. Over the past 12 years, the topics of cooperation between the agencies have been continuously enriched with growing academic influence. The seminar has developed into a well-known platform for the exchanges of S&T and innovation policies in Northeast Asia and the world.